Receive 20% on-going revenue or a 200% one-time bounty! Join the TradeGecko Referral Program and get paid for referring amazing brands - just like yours! Introduce the power of great inventory & order management to amazing businesses, just like yours! Alternatively, your distributors or suppliers may be excellent candidates as well. When you refer a business that becomes a TradeGecko customer, you receive a 20% on-going revenue share or a 200% one time bounty, your choice! There are no limits to how many referrals you can make. Want to help your referees be TradeGecko experts like you? Download and share training materials through our resource library. Get started by entering your email above to join the program. Someone from the team will reach out once you've been successfully enrolled! Once enrolled, simply refer others using your own unique URL or send an email from your new referral account with tracking code provided. When they become a TradeGecko customer, you will receive a 20% on-going revenue share or 200% 1-time bounty - your choice! "TradeGecko provides the automation and optimization for purchases orders, order management, and B2B wholesale as well as the accounting data we need for accurate financials." 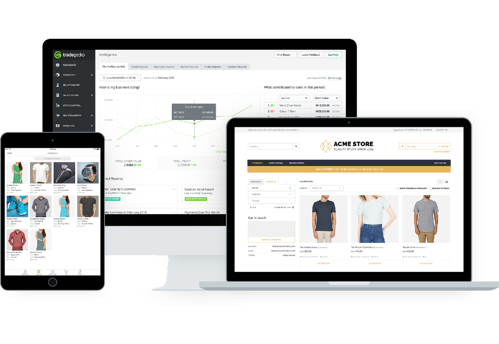 "TradeGecko's powerful integrations and ease of use make it our recommended app to businesses that need inventory management." "My clients tell me they need an inventory management software that is quick to deploy and scales as they grow their business. I always respond with just one word - TradeGecko."